So a couple of weeks ago, I did a nighttime run through Disney California Adventure that included some fun with long exposure shots, such as this photo of the Golden Zephyr. In that post, I explained a bit of the technical aspects of composing the shot. In the photo below, the same settings apply. As it turned out, I hit upon a sweet spot with my settings. Of course, there's always post processing involved. Shooting in RAW format, I had to open this in Adobe Photoshop (my program of choice, though Lightroom and Aperture are great alternatives, as are some of the non-proprietary software out there) and make adjustments. I opted for more of a purple-blue tint here, but I like the effect it creates, especially contrasted with the warm yellows of the Golden Zephyr lights. I hope you do too! 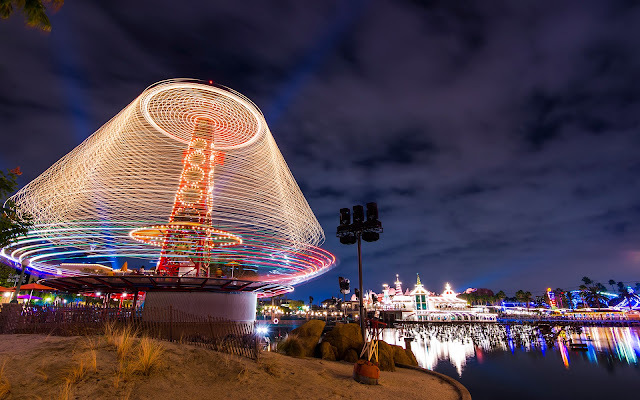 The Golden Zephyr spins brightly at night.